All too often we have left the ferry at Picton and headed straight for Kaikoura or Nelson, but this time we decided to spend some time in Marlborough. We were lucky and struck a perfect day for exploring the Wairau (or Vernon) Lagoons, just down the road from our park spot at Riverlands Roadhouse. The lagoons are part of an extensive wetlands area, sheltered behind a boulder bank at the south end of Cloudy Bay. The boulder bank, formed from gravel and stones washed up the coast by sea currents, runs for eight kilometres and two main lagoons have formed over the last 6500 years — Big Lagoon and Upper Lagoon. 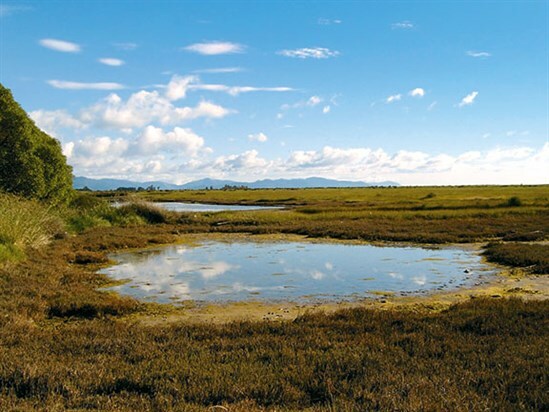 The circular walk takes three hours and gives an insight into the lagoons and the habitat they provide, skirting the Upper Lagoon and the channel that leads to the ocean at Wairau Bar. Excavations discovered the remains of a moa hunter camp at the northern end of the boulder bank. Water from the surrounding hills gathers behind the boulder bank and combines with the tide coming in and out, creating perfect living conditions for specific plants and animals between the high and low water marks. These potential food sources drew local Maori and evidence shows that early inhabitants of the area trapped birds and eels, even narrowing some of the channels to trap fish. 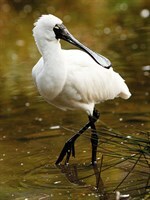 The wetlands are still full of life, from scuttling crabs and sinuous eels to over seventy species of birdlife. We are no experts but we spotted black swans (with their cygnets), royal spoonbills, and Canadian geese, along with other more common birds, such as shags. Sedge, glasswort, and other specialised plants thrive on the flat sandy tidal flats, bisected by streams flowing off the mountains. Our walk began at the car park at the end of Hardings Road, which leaves SH1 five kilometres south of Blenheim. There are various sign boards with information about the area, then the track splits. The walk can be taken in either direction but we headed on the shortest, left-hand track towards the wrecked remains of the SS Waverley. 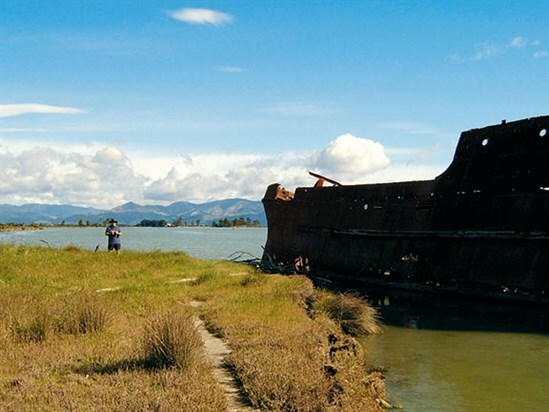 Built in 1883, the Waverley was towed from Wellington to the mouth of the Wairau River where she was to be scuttled to form a breakwater. However, a flood swept her up the channel and into the lagoons where she has remained since, slowly rusting away. At this point there is a side track that continues in the direction of Wairau Bar at the mouth of the Wairau River. Like the Polynesian arrivals before them, European pioneers made a settlement here in 1832. Sixteen years later, an earthquake improved navigation to the river and in 1855 another quake improved access further. This made it possible for sea-going vessels to navigate to Blenheim, then known as Beaver or Beavertown due to the frequent flooding. Back at the wreck of the Waverley there is a picnic bench and it's a beautiful spot to stop and watch the birds. The views are spectacular, with the Robertson Range to the north and White Bluffs to the south. 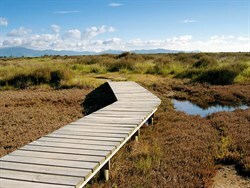 The return journey passes Budges and Moerepo Islands and then loops inland across the saltmarshes, crossed at their wettest by boardwalks. In the three hours we were at the lagoons we didn't see another soul and only heard the honks of geese and songs of the birds. There is no fresh water here so carry some with you on the hot, dry days that characterise Marlborough's summer. There is also a lack of shade trees, meaning the lagoons walk is very exposed to sun, driving wind and rain. Marlborough has a dry climate and fire is a significant hazard to human safety, natural areas and agriculture. Open fires are not permitted at any of the East Coast reserves and only portable stoves should be used for cooking. Please take your rubbish away with you — no facilities are provided. Hunting waterfowl: you require either a Fish & Game New Zealand game bird licence (obtainable from sports shops, Fish & Game New Zealand, or visit fishandgame.org.nz) or a specific DOC hunting permit (visit doc.govt.nz). If you plan to take a hunting dog, a separate dog permit is required. Contact the Marlborough District DOC office on (03) 572 9100 or email renwick@doc.govt.nz. To view the latest pesticides summary visit doc.govt.nz.